Remington B27591 11-87 Sportsman Deer Barrel - 20GA - Rifled - Mount FREE SHIPPING! Remington manufactures premier accessories, enhancements and replacement components for shotgun lovers. When deer hunting season comes along, the 11-87 Sportsman Deer Barrel may be just the companion you need. The 20-gauge 11-87 has a 3-inch chamber and 21-inch barrel. The fully-rifled choke maximizes constriction for better long-range shooting. 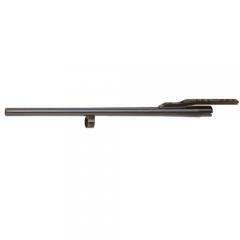 The barrel features a vent rib with cantilever scope mount, allowing for accurate eye alignment. The matte finish wards off glare and reflection while in the wild or on the range. Note: Allow 4-6 weeks for shipping and delivery from the manufacturer. ©2002-2019 CopsPlus.com: Remington B27591 11-87 Sportsman Deer Barrel - 20GA - Rifled - Mount FREE SHIPPING!